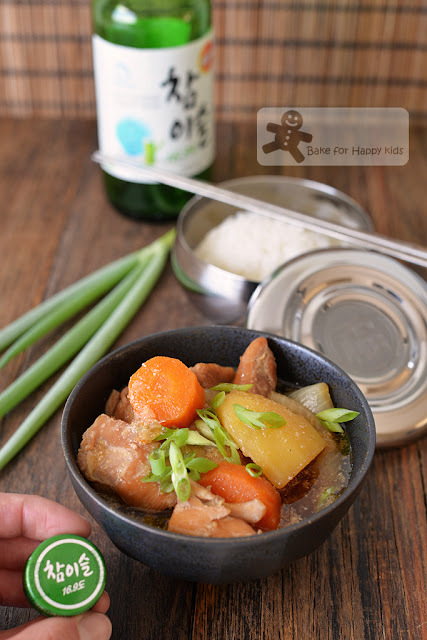 Bake for Happy Kids: Korean Soju Chicken Stew - Easy, Comforting and can be Children Friendly too! 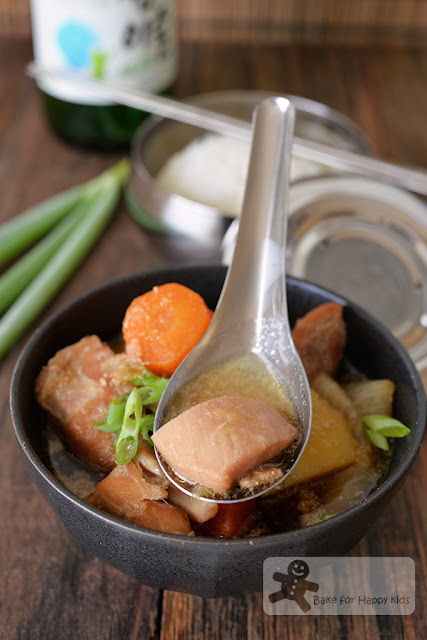 Korean Soju Chicken Stew - Easy, Comforting and can be Children Friendly too! "Mum, what are we having for dinner tonight? I'm starving!!!" "Huh?" And it was a loud "Huh!" from my son. LOL! For those who don't know Soju, it is the most popular alcoholic beverage in Korea. Mostly made in South Korea, Soju is clear and colorless with its alcohol content varies from about 18% to 45% alcohol by volume. Traditionally, Soju is made from rice, wheat or barley but these days, the modern Soju is made with potatoes, sweet potatoes or tapioca. In Korea, Soju is traditionally consumed straight and gradually becomes modernized, famous and popular as a base spirit for cocktails and mixed drinks with fruits, fruit juice and even yogurt. I bet you will ask... If Soju is great being a part of an alcoholic fruity drink, why am I using Soju to cook chicken? This is why my husband was giving me a skeptical look when I bought a bottle of Soju specially to cook this chicken stew... Well, guess what? This Soju chicken stew is really AWESOME!!! 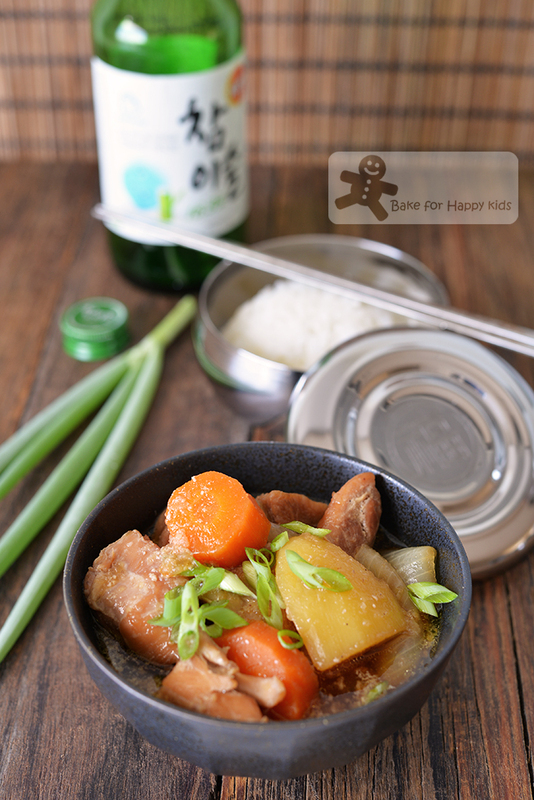 Fruity Soju in chicken stew? I must admit... This combination sounded a little ridiculous to me when I first saw the recipe from the book, Seoul Kitchen by Debbie Lee but the curious me insist that I should try! And so happy that I did!!! What can I say? Being curious is rewarding!!! So, what is the special taste of Soju chicken stew? Errr... Honestly, I'm really struggling to find the most right words to describe the taste of this stew. Due to the fact that the stew is cooked with a soy sauce based seasoned with mirin and brown sugar, it is obviously salty and sweet. As for the soju, its subtle taste comes in towards the last chew of the stew making the stew is so complete, smooth and comforting to slurp and eat with plain rice or noodles. Salty? Sweet? Subtle Soju taste? More? Errr... I'm so sorry that I'm so limited with my words describing this awesome stew! I guess that you just have to cook it, eat it and taste how awesome it is!!! Another good thing is that this stew is extremely easy to cook and you cook it in a way that it can be children friendly or also less-children friendly... LOL! 1) Use Soju with the lowest alcohol content. 2) You have to cut the chicken, potatoes and carrots into larger chunks and simmer the stew longer for at least 40 minutes. 3) At the last 15 minutes of cooking, remove the cover of the pot and allow the alcohol content to vaporise as much as possible. 4) Before serving the stew to the children, check and taste if you can taste any alcoholic heat in it. You know... Just to be sure. 5) You can choose to omit the addition of Soju if you want to be 100% sure that this stew is 100% non-alcoholic but I don't know if the stew is still good without the Soju. How can I be sure? My son ate lots of the stew for his dinner and he wasn't "drunk" afterwards. LOL! 1) Use Soju with any alcohol content that you like. 2) Instead of adding all of the Soju to simmer the dish, reserve 2-3 tbsp Soju and add the reserving Soju after the stew is removed from the heat. Easy!!! Now, are you curious enough to try cooking Soju chicken? Never knew that Soju can make a chicken stew so yummy! "Mmm... I'm impressed with your Soju chicken." Said my husband after his first mouthful of the stew. Not praising myself... I'm impressed with the stew too! Here's a video showing I cooked this easy chicken dish. Here's the awesome recipe that is adapted from the book, Seoul Kitchen by Debbie Lee. Using a food processor or blender, process all marinade ingredients until combined. Set aside. Combine chicken and marinade in a large bowl. Cover and refrigerate for at least 30 mins or more if desired. Heat oil in a large cooking pot over medium-low heat. Remove chicken from the marinade and cook for 2-3 mins in 2-4 batches until lightly brown. Due to the presence of mirin and brown sugar in the marinade, it is important to cook the chicken with medium-low heat so that the chicken won't burn easily. Transfer the seared chicken into a plate. IMPORTANT: Do not discard marinade. Return all of the chicken back into the cooking pot. Add 500ml (2 cup) water, soju and the remaining marinade and bring it to boil. If you wish to cook your Soju chicken with a finishing alcoholic kick, you can reserve 2-3 tbsp Soju and add the reserving Soju after the stew is removed from the heat. Add onions, potatoes and carrots plus more water if required, making sure that there is enough liquid to submerge all ingredients. Reduce heat to simmer. Cover and cook for about 40 mins or until all ingredients are cooked to tender. If you wish to fully cook off the alcohol content in your Soju chicken, remove the cover of the pot at the last 15 mins of cooking, and allow the alcohol content to vaporise as much as possible and add more water if required. Season with salt and white pepper. Remove from the heat and serve immediately. Serve with spring onions together with noodles or steamed white rice as a hearty meal.